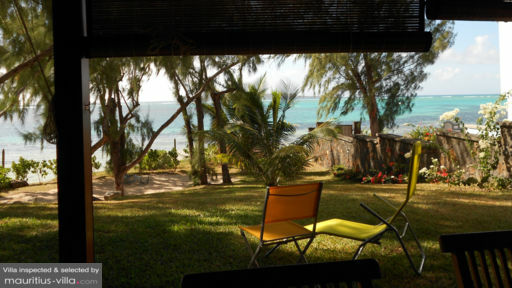 Nestled opposite one of the most scenic beaches in Mauritius, Villa Coin de Mire can comfortably accommodate up to six people, which is ideal for guests who want to enjoy a fun-filled holiday with friends and family. This villa does live up to its name and offers an exceptional view of the unique Coin de Mire islet which can be found in the sparkling turquoise lagoon. Exceedingly comfortable, with all the amenities you could ever wish for, this establishment also boasts around-the-clock security. Renovated in 2002, Villa Coin de Mire features a quintessential Mauritian architecture, with a thatched roof and a tropical garden. All the bedrooms are equipped with an air-conditioning system which will undoubtedly help you beat the notorious tropical heat. The master bedroom has its own en-suite bathroom which is fitted with a shower, toilet, double sink, mirror and other such amenities. The master bedroom also includes a king-sized bed. In addition, guests can also find two additional guest bedrooms with double beds and twin beds respectively. 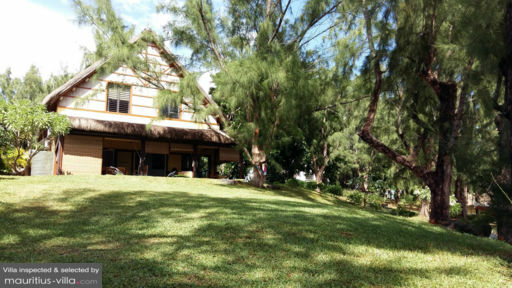 Because of its impressive proximity to the sea, guests will be able to breathe in the wondrous sea breeze every time they step out of the house. Indeed, the Villa Coin de Mire offers a direct access to the beach, which means that you will be able to enjoy a refreshing dip in the Indian Ocean virtually anytime you want to. This villa is also enhanced by a tropical garden, complete with lush, swaying palm trees and flowers of various kinds. If you want to head back home with a perfect tan, rest assured that several sun beds have been set up around the garden, where you can just lie back and relax as you bask in the tropical sun. In fact, guests will also be able to benefit from a set of outdoors furniture should they want to enjoy some Al Fresco dining. Best of all, a variety of barbecue facilities are also included to help you make the most out of the gloriously warm summer nights. To enhance a pronounced sensation of serenity and tranquility, all the living areas are set up to overlook the ocean or the garden. The spacious and airy living room offers comfortable amenities such as a large couch, coffee table and even a flat-screen television for those lazy indoor days. In addition, guests can enjoy their meals in the large dining room which also happens to overlook the scenic outdoors. As far as the living areas are concerned, guests will be glad to know that they can enjoy different types of amenities in the full-equipped kitchen. For example, a stove, microwave, fridge, dishwasher and the likes are included to make it far easier for you to whip up your own meals. Of course, if you want to enjoy a complete relaxation, the villa also offers the services of a cook to take care of your meals. Guests at Villa Coin de Mire can make the most out of their vacation thanks to the cleaning staff which remains at their disposal during the entire duration of their stay. From the washing up to the laundry, rest assured that your housekeeper will provide you with a pristine and relaxing environment to relax in. By the same token, it is possible to hire the services of the in-house cook to take the cooking off your hands. Villa Coin de Mire is a mere half hour drive away from the coastal village of Cap-Malhereux. 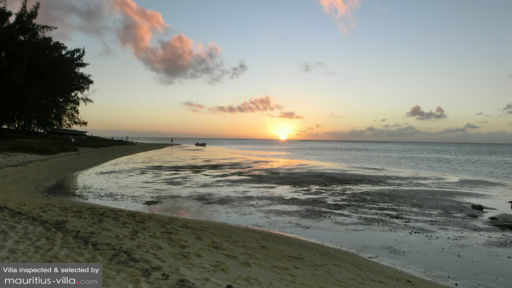 Found at the very north of Mauritius, this village is ideal for anyone who wants to buy souvenirs or shop for freshly caught fish which you can cook in the privacy of your villa. In addition, the villa is also found close to Peyrebere beach, which is often hailed as one of the most pristine beaches on the island. In fact, this particular public beach is also renowned for its intricate sand sculptures which are freshly sculpted by a local artist on a daily basis.